A lag schedule of reinforcement is one way to increase response variability; however, previous research has been mixed with regard to the necessary parameters to increase variability. For some individuals, low schedule requirements (e.g., Lag 1) are sufficient to increase variability. 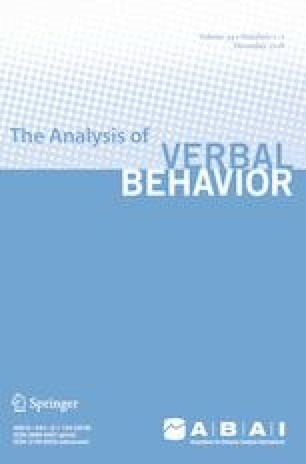 For other individuals, higher lag schedules (e.g., Lag 3) or a lag schedule in combination with prompting is needed to increase variability. We evaluated the efficiency of different within-session progressive lag schedules to increase response variability with 2 children with autism. Results showed that increasing the lag criterion across sessions increased variability to levels similar to beginning with a high lag schedule for one participant. When lag schedules did not increase variability for the second participant, we compared a variety of prompting procedures. Results of the prompting evaluation showed that a tact-priming procedure was effective to increase varied responding. The online version of this article ( https://doi.org/10.1007/s40616-018-0102-5) contains supplementary material, which is available to authorized users. We thank Batool Alsayedhassan for her assistance in collecting data. Tables 4, 5 and 6 are examples of sessions that consist of 3 different responses (Tables 7 and 8 consist of 6 and 10 responses, respectively); however, the average variability score is different based on the within-session response patterns.